FMC OPTICS:Compact binoculars adopts advanced fully multicoated (FMC) optical lenses, glare while high-index prisms deliver crisp images with superior sharpness and contrast guarantees superior light transmission and increases brightness. WIDE FIELD OF VIEW: 50MM ultra wide angle objective lenses, binoculars will bring you broader field of view,168 feet field of view at 1000 yards; clear and sharp wide angle image without any color difference. 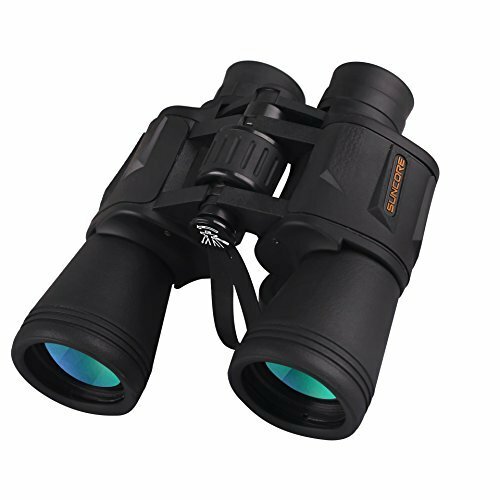 ERGONOMIC DESIGN:Binoculars with nonslip rubber protective layer provides you a soft texture & firm grip.Magnalium framework and rugged non-slip rubber armor – Its tight fitting protection makes it usable to withstand the tougher weather conditions.